Regina School Division No. 4 of Saskatchewan (Regina Public Schools) is one of the largest school divisions in the province, serving the educational needs of more than 24,000 students in 44 public elementary schools, 8 public high schools, 3 faith-based associate schools, as well as at Campus Regina Public and the Allan Blakeney Adult Campus. 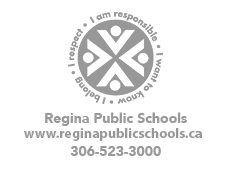 Regina Public Schools is directed by a Strategic Plan intended to convey the division's goals, intentions and aspirations for all students, regardless of their ethnicity, ability, aspirations or life circumstances. This includes students who need intensive supports and those whose first language is not English. It includes First Nations, Métis and Inuit learners, as well as those who attend the three faith-based associate schools. The Strategic Plan is guided by the school division's mission statement (To instil the value of knowledge, the dignity of effort and the worth of the individual) and by our Shared Values: I belong; I am responsible; I respect and I want to know. These values give direction to what we teach both inside and outside the classroom. Students take responsibility for themselves and for others in the community by participating in activities ranging from progress report conferences with teachers and parents/caregivers to collecting food for the food bank. The school division celebrates and embraces multiculturalism and respects individual spiritual beliefs. Our Shared Values transcend our differences and provide an equal opportunity to recognize and encourage the unique characteristics and contributions of students, parents/caregivers and staff. Please CLICK HERE to learn more about our Shared Values. anti-racism and cross-cultural training programs for students and staff. When you enrol your child in a Regina Public school you place him/her into the trust of a team of professionals dedicated to helping your child. Our staff are compassionate, bright, energetic, supportive and willing to try new innovative, research-based programs to help children learn. These new and exciting programs also encourage children and youth to remain in school. Building on the requirements of the provincial Core Curriculum, Regina Public schools emphasize the Common Essential Learnings: communication, critical thinking, technological literacy, numeracy, independent learning, personal and social skills, and values. Student progress is closely monitored and system-wide testing provides statistical evidence of our students’ on-going academic achievements. Annually, Regina Public Schools students are recognized for their success through a wide variety of awards and scholarships. Diverse programming options allow students to prepare for their future whether they choose to pursue post-secondary education or to enter the work force. Quality education involves a partnership between students, parents/caregivers and staff. You are invited to attend a parent forum or the annual parent convention. You may wish to become an active member of the parent association or a volunteer at the school. You also support your child in his/her efforts at school by helping with homework or reading with him/her at home. We look forward to meeting you and your child. With supervision, students have access to the Internet as an information source for curriculum and research. There are over 4,000 computers in Regina Public Schools. This number continues to grow while equipment upgrades are also ongoing. New courses in multimedia are being offered to students, expanding their horizons. The Regina Board of Education is proud to offer an extensive range of program options to meet the needs of all students. Educational psychologists, school social workers, speech-language pathologists, consultants, program specialists and assistants are employed by the Board of Education to provide their expertise. Programs exist for students with mental and/or physical challenges, students with learning disabilities, students with behavioural disorders and at-risk youth. For more information on any of our schools or programs, please browse through our website or contact us directly.